Engineered and purpose-built fire safety bunkers at an affordable price to every Australian. Originally Wildfire Safety bunkers were designed in the United States to assist residents during natural disasters such as cyclones, tornados and hurricanes. Our bunkers have been installed in over 40,000 different locations since 1978. In the US our products have been put to the test on many occasions and have a proven track record for strength and reliability. Each year in Australia our weather seems to become more unpredictable with higher than average winds and extreme temperatures. Forecasts from the Climate Institute of Australia and the CSIRO predict that Australia will experience an increasing occurrence of WILDFIRE events that threaten life and property. It is predicted that by the year 2020, Extreme Fire Days will increase in occurrence by up to 65% and then by the year 2050 the increase will be up to 300%. The fire season will start earlier and last longer and will be more intense throughout the season's length. Very extreme fire days which to date occur on average every 11 years will occur every 5-7 years by 2020 and every 2-3 years by 2050. (Information obtained from a report prepared for the Climate Institute of Australia, pages 2 - 6 of the Executive Summary). Our product has been specifically designed and constructed as a fire safety bunker and is not a modified concrete water pipe, tank or pit. The bunker itself is made from heavily reinforced 100mm - 4” thick concrete and has a total weight of 5.5 tonnes. The standard six person bunker is a completely sealed unit that provides approximately 7.2 cubic metres of air. The bunker is rated as having sufficient passive air supply to support 6 adults for one hour. Residents who live in isolated areas and areas of surrounding bush land are at high risk during the bushfire season and may wish to consider the installation of a fire shelter. When situations change and the time to execute the evacuation plan has been cut short, a Wildfire Safety Bunker could be a residents last option. 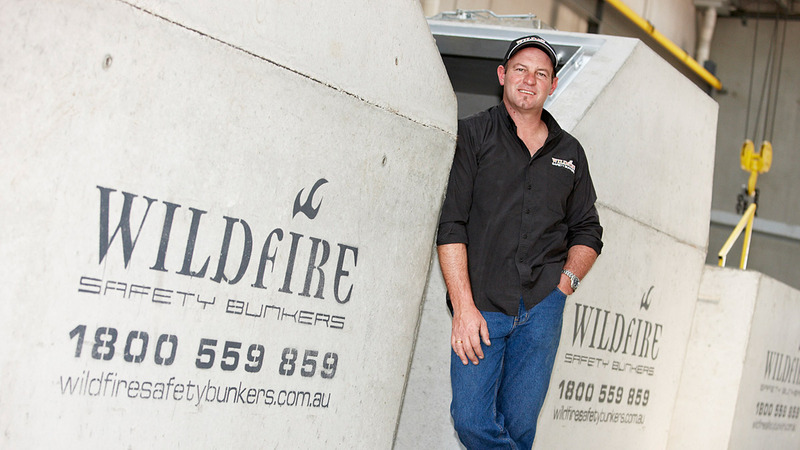 Company director Anthony Tratt of Wildfire Safety Bunkers Pty Ltd has over 25 years experience in commercial and domestic construction. During this time he has spent eight years at BHP research laboratories in Melbourne Victoria. This facility specialized in fire and load testing of many products these included concrete and steel. 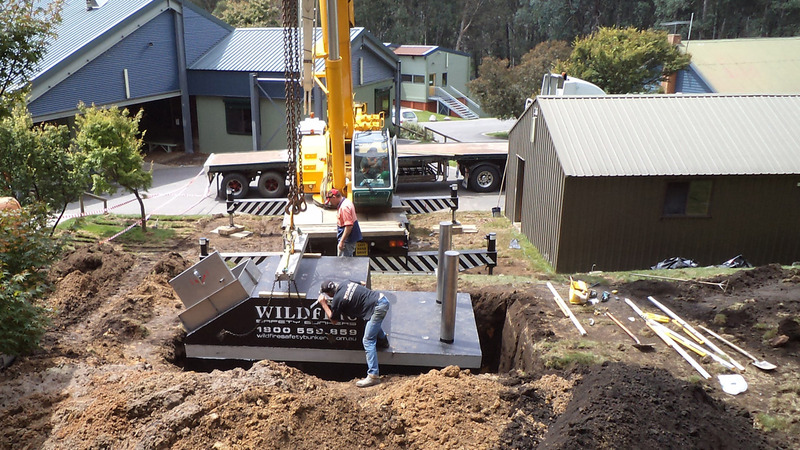 "We are committed to supplying and installing superior quality fully engineered and purpose built fire safety bunkers at an affordable price to every Australian"
Installation time for a standard 6 person bunker in clean soil is 4 hours. Not only are our bunkers very easy to install but they are also able to be relocated if required. We can organise the installation or assist in advising an installer of your choice. We also conduct annual maintenance inspections (by appointment) to ready the bunkers for the upcoming fire season. All damaged or worn parts will be replaced at this time and advice will be given regarding site access conditions.